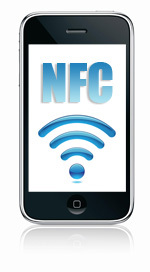 Have you heard of Near Field Communication (NFC)? If you haven’t, you’ll probably be hearing about it quite a bit in the near future. With 48% of American households now owning a smartphone as of January 2012, and as more and more of the newer phones coming on the market become NFC-enabled, and as smartphones get cheaper, marketers would be smart to keep an eye on how to leverage this seamless technology for on site marketing opportunities. On site terminals that pass coupons on to the customer (near the product itself) and redemption at the POS all through the customer’s cell phone. Passing of events and business contact info directly to user’s calendars and address books respectively. Queuing applications for attractions and restaurants that automatically place you in the queue and update your wait time. Self guided tours with supplemental text, audio, and imagery being passed through NFC terminals in milliseconds. What’s increasingly clear is that more and more users will be interacting with your online presence with a mobile device as their primary point of contact. Will you be ready to greet them not only prior to their visit to your location, but also while they’re on site? This entry was posted in Mobile and tagged mobile, Near Field Communicaion, pay terminal, radio signals, rfid technologies, Smartphones. Bookmark the permalink.